(TriceEdneyWire.com) - Empowered with a record 55 members on Capitol Hill, the chairwoman of the Congressional Black Caucus has teamed up with a coalition of Civil Rights groups to mobilize African- Americans across the country behind a progressive legislative agenda to write a new chapter of American History that is now being led by women and people of color. 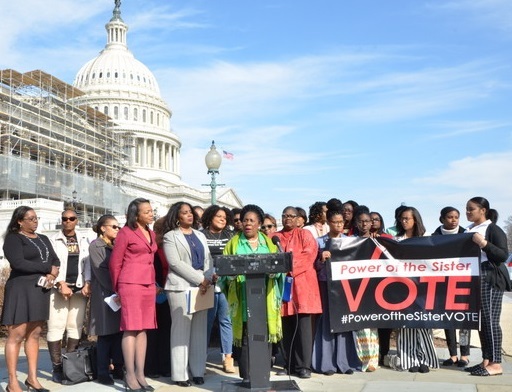 Recently on Capitol Hill, Bass teamed up with her female colleagues and a coalition of Civil Rights activists, led by the Black Women’s Roundtable, to expound upon that effort. Campbell, whose organization is dedicated to organizing voters and fighting against voter suppression said, “We are determined to make sure that we save our Democracy from peril,” and echoing those sentiments were a number of speakers from across the country. Cassandra Welchlin, co-Convener with Campbell and lead organizer of the Mississippi Black Women’s Roundtable, said poor women are dying because of federal cut backs. Welchlin talked about how a young mother died in Houston, Miss. after she had an asthma attack because the emergency room at the closest hospital to her home had been closed because of Medicaid cutbacks.